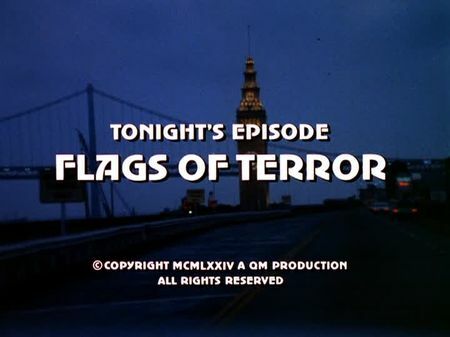 The screencaps for Flags of Terror are accessible on the episodes' page right now. A group of young local terrorists tries to import a highly-sophisticated, photo camera-based bomb device into the United States. When the mission fails during Customs control at the port of San Francisco, the group takes two civilians, an Navy sergeant, and Steve hostage. Mike has to deal not only with the terrorists but also with a right-wing journalist and a vengeful father whose daughter was killed when the terrorists tried to escape. Police has to face a tough confrontation with young people who seem to be more than just determined. When the terrorists send Steve to the boat pier in order to transmit their conditions, Mike tells him about the bomb's radio-controlled mechanism. Back on the boat where the group is held hostage, Steve tries to apply his psychological skills in an effort to separate the group's members and to finally provoke a fight with one of the terrorists so that another hostage can spy on the details police needs to know. Upon arrival of the sea-plane the terrorists requested, the tensed situation is coming to its climax. This episode starts out with an unusual sequence taken in Japan (which is supposed to be in Tokyo) where the terrorists are obtaining their lethal weapon. We are then taken to Pier 33 where Mike and Steve are searching an ocean cruiser for a package. Simultaneously, the terrorists are trying to pass US Customs at that pier. When the Customs inspector smells something's happening, the groups tries to escape, running northbound on The Embarcadero before getting on their escape van in front of Pier 35. In the following chase, their van and the police cars - including Steve's - pass by Broadway as well as Mission, then hopping over to the Industrial Harbour where the escapees pass a police block at King & Towsend Streets, leading them south over Lefty O'Doul Bridge. The hostages are taken onto a yacht moored in the Central Basin. This is where Mike establishes the command station and where we stay throughout the rest of this suspense-packed episode.